Gateway Baptist Church is an independent, fundamental and premillennial Baptist Church concerned about where people will spend eternity. Our goal as a church is to give out the Gospel of Jesus Christ as found in the Bible. We use the King James Bible and believe it is our sole authority for doctrine and Christian living. We are a church that is very concerned about where people will go when they die. The Bible says: "And as it is appointed unto men once to die, but after this the judgement. "- Hebrews 9:27. Where will YOU spend eternity after this life is over? The Bible is very clear about "how" to enter Heaven. The weekly services are filled with soul-stirring music which prepares the heart for the preaching of God's Word. We believe the Bible is the standard for conduct in a sin-filled world. We take seriously its command to come out of the world and live a separated life. In today's world of contemporary Christianity, we strive to practice a godly walk. 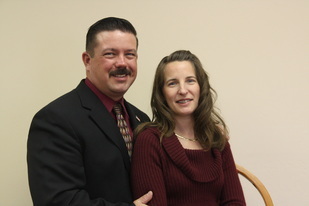 Gateway Baptist Church was started in 1999 by Pastor James (Jim) Winkler and his wife Judy. This was the ninth and final church that Brother Winkler started before the Lord called him home in 2004. In 2000, Gateway Baptist Church was able to purchase the original 1918 bank building and former St. Laurence Catholic church in downtown Humboldt. In 2011, Gateway Baptist Church moved to their present location on the corner of Hwy. 69 and Prescott Dells Road in Dewey-Humboldt. Pastor Steve Lain was saved at the age of 10 when his grandmother lead him to the Lord. In 1993 at youth camp, he surrendered to serve the Lord in full-time ministry. Pastor Lain attended Pacific Coast Baptist Bible College / Heartland Baptist Bible College where he met and married Heide Huddlestun in December of 1996. In May of 1999, the Lains graduated from Bible College and moved back to Stockton, CA. to minister in their home church, Stockton Baptist Church, under the leadership of Pastor Steve Kihlthau. In May of 2002, Pastor Lain was ordained into the gospel ministry by his home church, Stockton Baptist Church. He was sent out to minister in Gateway Baptist Church under Pastor Jim Winkler. Upon Pastor Winkler’s retirement in 2004, Gateway Baptist Church called Steve Lain to be their pastor. Pastor Lain is a man with a God-given vision to reach the Quad-City area with the Gospel of Jesus Christ. Our pastor preaches the Word of God without compromise. He loves God and His people. Pastor Lain is a man full of compassion and truly is a man of God! Pastor Steve and Heide Lain have five children who all help serve in the ministry. Inspire people to develop a heart for God (Psalm 34) through Christ-honoring music and Biblically-sound preaching. Include them in a loving church family (Acts 2:41) through membership into our church family and fellowship with other believers. Instruct them in Bible doctrines ( II Tim. 2:2) through Adult Bible Classes, Sunday School Classes and the Discipleship Program. Involve them in ministry (I Peter 4:10) through weekly ministry opportunities. Impact the Dewey-Humboldt area and the regions beyond with the Gospel of Jesus Christ (Matt. 28:18-20) through weekly soul winning, a worldwide missions program and by training and equipping Christians to share Christ in the course of their daily lives. We are a Fundamental, Independent Baptist Church located in the quad-city area. We emphasize the preaching and teaching of the Bible that is both instructive and relevant to meet today's ever demanding needs and problems. We believe that God has inspired and preserved His Word for us in the King James Bible. The music at Gateway Baptist Church reflects an uplifting and Christ-honoring spirit through our song service, our choir and our special music. Our church wants you to feel warm and welcome from the moment you park your car to the last hand shake. Our friendly greeters will welcome you as soon as you walk in the door to help guide you to the appropriate services. We have a clean, lovingly staffed nursery for newborn up to three years of age, as well as Junior Church for ages three through the sixth grade. Sunday School begins at 10 AM. We encourage you to join us for challenging teaching lessons from the Word of God. If you should have any questions while you are with us, our helpful Ushers or Pastor are available prior to and after the service. We have designated parking spots for handicapped and senior saints who need to park close to the church entrances. As a visitor, we consider you our honored guest and have specially reserved visitor parking just for you right next to our auditorium as well. AM I SUPPOSED TO GIVE IF I'M NOT A MEMBER? We have an infant and toddler nursery available during the Sunday School hour, Sunday morning worship, Sunday night and Wednesday night services. Gateway Baptist Church offers a clean, safe, well-staffed nursery for infants through three years of age. Our staff is ready to make your little one's experience a time of fun and learning. A nursery is provided for all of our services and special events. HOW CAN MY FAMILY AND I SERVE IN YOUR CHURCH? Gateway Baptist Church has many ministries and opportunities to serve the Lord. Although most of our ministries require you to be a member, there are several available to those who are visiting and prayerfully considering membership such as Saturday soul-winning. DO YOU OFFER SPECIAL CLASSES FOR DIFFERENT AGE GROUPS? We offer classes for all ages. Sunday school is a great opportunity to break the congregation down into smaller groups that are targeted to specific needs in your life. Be ready to be challenged in your personal walk with God and expect to receive biblical truths and spiritual help. We have several ministries for children from Sunday School, Junior Church, Kings Kids mid-week program to special summer programs. If you feel that God is leading you to become a member of Gateway Baptist Church, please request a meeting with the Pastor. Upon meeting with the Pastor, he will discuss with you the matter of your salvation and the method and motive of your baptism. You may become a member either by transfer of letter, baptism or by statement of faith. We are located in Dewey-Humboldt on the west side of Hwy. 69 at mile marker 280.